Please write “MIKE KRAJNAK” on the check memo line or in the memo or account field in your online bill payer. Mike Krajnak is the ISEED Intern Coordinator for IFI. He is responsible for designing, developing, and coordinating the 10-month Internship program that disciples international students and prepares them to take the gospel back to their home countries. Mike has a Computer Engineering degree from Case Western Reserve University and has worked with internationals for 37 years as a computer consultant. He has led many business and leadership courses. Mike enjoys hiking and photography. Mike came to faith in Christ through a campus worker at college in 1978. Mike took the Perspectives on the World Christian Movement course in 2014 and it turned his world upside down. In 2015 he attended the Urbana missions conference and heard God tell him to retire early and start a new student ministry. In 2017 Mike left his job to come full time on IFI staff. Tish is the Mobilization Administration Assistant at IFI. She is responsible for coordinating administrative volunteer work. Tish has an Associate degree in Accounting from Columbus Business University. She has taken Chinese classes at OSU to better converse with the international students. Tish enjoys jewelry making and teaching. 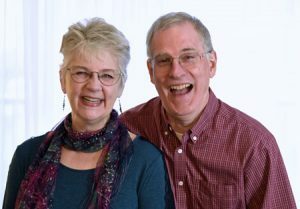 Mike & Tish have been volunteering for IFI since 2010 and hosted over 50 students in their house. They first met on an international trip to Israel and have been married 28 years. Mike and Tish are blessed to have Joe, a special son. They traveled to China in 1999 to adopt their daughter Renee. Both traveled to Ireland in 2017 to trace Tish’s Irish roots. Mike & Tish both have led a weekly investigative International Student Bible study for the past 3 years. They have been on multiple IFI student trips and have been blessed to impact many students through the English conversation program. The Krajnak’s are in the process of funding their ministry and would sincerely appreciate your prayers and support.